Meeting Management - Scheduling with full Outlook / Lotus Notes / GMail Calendar integration. is easy and intuitive. 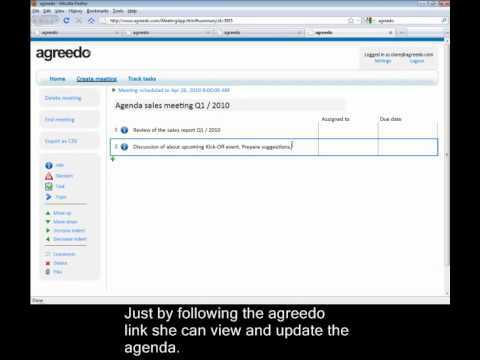 Agreedo provides a feature-rich Meeting Minutes with task assignment, decision, topics and info items. Premeeting Collaboration - Before the meeting starts the project manager creates and shares the agenda. Every attendee can add comments or even add additional items. Integrated email allows for attendees to signal important changes or request further information. File Management - All relevant information whether it's word, pdf even images can be attached to meeting items. Task Dashboard - Agreedo lets you see your open tasks and the open tasks you've assigned. Team Collaboration - Agreedo empowers teams, increasing their acceptance of, and participation in, meetings. With Agreedo, front-line conversational information and commitments flow upward, enabling greater accuracy in task and more informed decision making. Task Tracking - Agreedo lets you view and interact through tasks with all team members. Due tasks are automatically signalled to the assignee. Follow Meetings - Agreedo allows you to create followup meetings for recurring topics. The moderator easily selects topics from the current meeting to be on the followup-meeting and send out the invitation to all attendees with one click. Product Integration - Agreedo integrates seamlessly with all business-critical applications empowering managers with all the information they need to make informed and accurate decisions. Agreedo comes with turnkey integrations for Microsoft Outlook, Lotus Notes, GMail Calendars and many more. Universal Compatibility - Agreedo is an IT friendly solution to manage all meeting content with world-class efficiency. Agreedo is browser independent and works on Windows, Mac, or Linux, and even on your favorite mobile device helping teams get work done everywhere. Auditing & Governance - Providing a central repository for all project information enable _task to seamlessly create an audit trail to authenticate compliance with corporate standards. Integrating cross-departmental collaboration, visibility and compliance eliminates the need for disparate, department-specific software, email, or other patchwork approaches. The current functionality is free to use. Since there’s no getting away from meetings altogether, the next best thing is to optimize how the time is spent. Sending out an agenda in advance can help get things moving. Following up with meeting minutes along with assigned tasks facilitates keeping people up to date on what the next steps are. Agreedo provides a 360-degree view of all meeting activities: scheduling, collaboration on meeting content and following up on tasks and decisions all in one fast and easy to use tool, helping both team members and management alike to better understand and organize their work. Below are some frequently asked questions for AgreeDo. Q. What type of pricing plans does AgreeDo offer? Q. Who are the typical users of AgreeDo? Q. What languages does AgreeDo support? Q. Does AgreeDo support mobile devices? Q. Does AgreeDo offer an API? No, AgreeDo does not have an API available. Q. What other apps does AgreeDo integrate with? Q. What level of support does AgreeDo offer? Q. Which apps is AgreeDo compared to most often?